هدف از پژوهش حاضر، بررسی عملکرد سیمای جمهوری اسلامی ایران در حوزه علم و فناوری و شناسایی مؤلفه‌های اصلی برنامه‌سازی تلویزیونی با رویکرد ترویج علم بوده است. در این پژوهش، با روش مطالعه میدانی، عملکرد رسانه ملی در حوزه علم و فناوری، بررسی گردید و با روش مصاحبه اکتشافی، عناصر اساسی برنامه‌سازی با رویکرد ترویج علم استخراج و تحلیل شده است. یافته‌ها نشان می‌‌دهد که برنامه‌های علمی، به‌طور متوسط 4 درصد از برنامه‌های سیما را در ده‌ سال گذشته، به خود اختصاص داده‌اند. از طرفی، بالاترین میزان پخش برنامه‌های علم و فناوریِ از شبکه‌های ملی تلویزیون جمهوری اسلامی ایران مربوط به سال 1390 بوده است. همچنین نتایج حاکی از آن است که در برنامه‌سازی فاخر با رویکرد ترویج علم، مواردی همچون پژوهش فراگیر برنامه‌ای، انتخاب عوامل و بویژه تهیه‌کنندگان آشنا با ترویج علم و نیز مؤلفه‌هایی همچون توجه به ساده‌سازی مفاهیم پیچیده، اتقان و استحکام مباحث علمی، پرهیز از شبه‌‌علم و ضدعلم و به‌روز بودن موضوع برنامه باید رعایت شود. 1Ph.D. in Knowledge and Information Science Studies, Qom Uni. 2Associate of prof. in Knowledge & Information Science, Tarbiat Modares Uni. 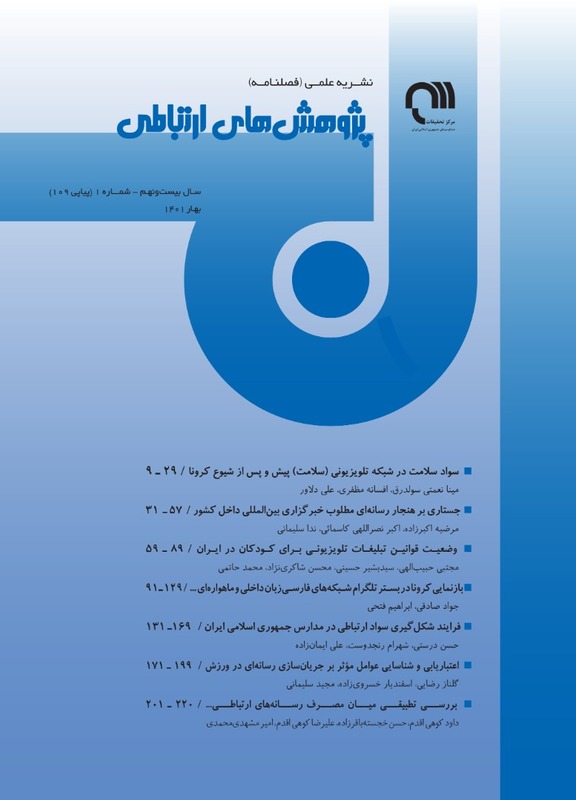 The purpose of this article is to study the performance of television of IRIB in the field of science and technology, and identify the major elements of TV programming with the science-promoting approach. In this research, using the field study method and by exploratory interviews, the national media performance in the field of science and technology was examined. The major elements of programming have been extracted and analyzed with the science-promoting approach. The findings show that scientific programs have been featured with the rate of 4% out of whole TV programs during the last decade. The highest rate of broadcasting of science and technology programs from IRIB TV was in 2011. Finally, some points must be regarded in high Programming with science-promoting approach, such as comprehensive research in programming, selecting television program creators especially producers who are familiar with the promotion of science, simplifying complex concepts, strengthening and documenting scientific topics, the avoidance of pseudo-science and anti-science, and the relevance and being updated of the subject program. ابن‌خلدون، عبدالرحمان‌بن محمد. (1336). مقدمه ابن‌خلدون (ترجمه محمد پروین گنابادی). جلد دوم، تهران: بنگاه ترجمه و نشر کتاب. اجاق، زهرا و همکاران. (1391). تبیین ماهیت و ضرورت درک عامه از علم. آموزش مهندسی ایران، 14 (56)، صص 132 ـ 117. آهنی‌امینه، زهرا. (1394). طراحی الگویی جهت ترویج و بازارسازی علم و فناوری در جمهوری اسلامی ایران از راه ارزیابی تأثیر رسانه‌ها در رویکرد مردمی به توسعه علم و فناوری (مورد مطالعه صداوسیمای ج.ا.ا.). پایان‌نامه دکترای مدیریت رسانه، دانشگاه تهران، پردیس بین‌المللی کیش. اوراوف، یی‌بی و آیزاکس، آلن. (1372). فرهنگ علم (ترجمه ابوالقاسم سیاه‌قلم و همکاران). تهران: مازیار. بوتچی، ماسیمیانو. (1394). علم در جامعه: مقدمه‌ای بر مطالعات اجتماعی علم (ترجمه مصطفی تقوی و علی برزگر). تهران: آگاه. پایا، علی. (1390). نگاهی شتاب‌زده به تاریخچه ترویج علم در حیطه عمومی. فصلنامه روش‌شناسی علوم انسانی، 67، صص 65 – 35. رجبی‌فروتن، عبدالحسین؛ شیخ‌رضایی، حسین و کرمی، حسین. (1390). نگاهی به نحوه حضور علم در رسانه‌های نوین. رسانه، 84. زارع، مهدی. (1389). دانستن حق من است: نگاهی به نقش رسانه‌ها در همگانی کردن علم. روزنامه شرق، 22/01/1389، ص 12. زتل، هربرت. (1384). راهنمای تولید برنامه‌های تلویزیونی (ترجمه علی رجب‌زاده طهماسبی و مجدالدین طباطبایی‌راد). تهران: دانشکده صداوسیما. زردار، زرین و خانیکی، هادی. (1393). علم در رسانه‌ها؛ بررسی فرایند برساخته شدن علم در چارچوب‌های رسانه‌ای. پژوهشنامه پردازش ومدیریت اطلاعات، 29 (4)، صص 902 ـ 875. فهیمی‌فر، علی‌اصغر. (1391). مروری بر رویکردهای ارتباطی و زیبایی‌شناختی در مطالعه تلویزیون. مجموعه مطالعات رسانه؛ به کوشش سید‌حسن حسینی و همکاران. تهران: پژوهشگاه علوم انسانی و مطالعات فرهنگی. قانون خط‌مشی کلی و اصول برنامه‌های سازمان صداوسیمای جمهوری اسلامی ایران. (1361). بازیابی شده از: پایگاه اینترنتی مرکز پژوهش‌های مجلس شورای اسلامی. کیوی، ریمون و کامپنهود، لوک‌وان. (1379). روش تحقیق در علوم اجتماعی (نظری و عملی) (ترجمه عبدالحسین نیک‌گهر‌). چاپ پنجم، تهران: توتیا. گزارش میزگرد پژوهشی بررسی وضعیت برنامه‌سازی علمی در تلویزیون. (1391). تهران:‌ صداوسیمای جمهوری اسلامی ایران، اداره کل آموزش و پژوهش سیما، مدیریت پژوهش سیما، گروه دانش. مفاخر، زهرا. (1384). درآمدی بر مفاهیم و اصطلاحات برنامه‌سازی سیما (چشم‌اندازی بر واژگان تخصصی تلویزیون). تهران: معاونت تحقیقات و برنامه‌ریزی، دفتر تشکیلات و سیستم‌ها صداوسیما. میرزایی، علی و حیدرزاده، توفیق. (1370). مجله‌های علمی عمومی وسیله‌ای برای ترویج علم. رسانه، 7، صص 39 ـ 36. میلرسون، جرالد. (1381). تولید و کارگردانی در تلویزیون (ترجمه غلامرضا طباطبایی). تهران: سازمان مطالعه و تدوین کتب علوم انسانی دانشگاه‌ها (سمت). Ampuja, M.; Koivisto, J. & Väliverronen, E. (2014). Strong and Weak Forms of Mediatization Theory. A Critical Review. Nordicom Review, 35, Pp.111-123. Besley, J. C. & Nisbet, M. (2013). How Scientists View the Public, the Media and the Political Process. Public Understanding of Science (Bristol, England), Vol. 22, No. 6, Pp. 644-659. Boon, T. (2015). The Televising of Science is a Process of Television: Establishing Horizon, 1962–1967. The British Journal for the History of Science, Vol. 48, No. 1, Pp. 87-121. Cheng, D. & et al. (2010). Communicating Science in Social Contexts: New Models, New Practices. Springer Netherlands. Cherry, C.; Hopfe, C.; Mac Gillivray, B. & Pidgeon, N. (2015). Media Discourses of low Carbon Housing: The Marginalisation of Social and Behavioural Dimensions within the British Broadsheet Press. Public Understanding of Science, Vol. 24, No. 3, Pp. 302 -310. Cole, S.A. (2015). A Surfeit of Science: The “CSI effect” and the Media Appropriation of the Public Understanding of Science. Public Understanding of Science, Vol. 24, No. 2, Pp. 130-146. Cornelis, G. C. (1998). Is Popularization of Science Possible?. in Paper Presentado en el Twentieth World Congress of Philosophy, Boston, Massachuetts, Pp. 10-15. De Cheveigné, S. & Véron, E. (1996). Science on TV: forms and Reception of Science Programmes on French Television. Public Understanding of Science, Vol. 5, No. 3, Pp. 231-253. Dudo, A.; Brossard, D.; Shanahan, J.; Scheufele, D.A. ; Morgan, M. & Signorielli, N. (2011). Science on Television in the 21st Century Recent Trends in Portrayals and Their Contributions to Public Attitudes toward Science. Communication Research, Vol. 38, No. 6, Pp. 754-777. Florensa, C.; Hochadel, O. & Tabernero, C. (2015). Science on Television: Theory Meets Pratice. An Introduction. Actes d'Història de la Ciència i de la Tècnica, 7, Pp. 11-16. Gerbner, G. (1987). Science on Television: How it Affects Public Conceptions. Issues in Science and Technology, Vol. 3, No. 3, Pp. 109-115. Ivanova, A.; Schäfer, M.S. ; Schlichting, I. & Schmidt, A. (2013). Is there a Medialization of Climate Science? Results from a Ssurvey of German Climate Scientists. Science Communication, Vol. 35, No. 5, Pp. 626-653. Jurdant, B. (1993). Popularization of Science as the Autobiography of Science. Public Understanding of Science, Vol. 2, No. 4, Pp. 365-373. Kirby, D. A. (2014). Science and Technology in film: Themes and Representations. Routledge Handbook of Public Communication of Science and Technology, Pp. 97-112. León, B. & Erviti, M. C. (2015). Science in Pictures: Visual Representation of Climate Change in Spain’s Television News. Public Understanding of Science, Vol. 24, No. 2, Pp. 183-199. Maeseele, P. & Desmet, L. (2009). Science on Television: How? Like that!.JCOM. Journal of Science Communication, Vol. 8, No. 4, Pp. 1-10. Maier, M.; Rothmund, T.; Retzbach, A.; Otto, L. & Besley, J. C. (2014). Informal Learning Through Science Media Usage. Educational Psychologist, Vol. 49, No. 2, Pp. 86-103. Murriello, S.; Spera, A. & Andrade, H. (2014). Visualizing Scientist on Argentinian TV. 13th International Public Communication of Science and Technology Conference 5-8 May 2014, Salvador, Brazil. Raza, G. (2009). Introduction Mapping Public Understanding of Science. Science Technology & Society, Vol. 14, No. 2, Pp. 211-219. Reid, G. (2012). The Television Drama-documentary (Dramadoc) as a form of Science Communication. Public Understanding of Science, Vol. 21, No. 8, Pp. 984-1001. Ren, F. & Zhai, J. (2014). Communication and Popularization of Science and Technology in China. Springer Berlin Heidelberg. Retzbach, J.; Retzbach, A.; Maier, M.; Otto, L. & Rahnke, M. (2013). Effects of Repeated Exposure to Science TV Shows on Beliefs About Scientific Evidence and Interest in Science. Journal of Media Psychology, Vol. 25, No. 1, Pp. 3-13. Rödder, S. (2009). Reassessing the Concept of a Medialization of Science: a Story from the “Book of Life”. Public Understanding of Science, Vol. 18, No. 4, Pp. 452-463. Rödder, S. (2011). Science and the Mass Media–‘Medialization’as a New Perspective on an Intricate Rrelationship. Sociology Compass, Vol. 5, No. 9, Pp. 834-845. Rose, S. (2001). What Sort of Science Broadcasting Do We Want For The 21st Century?. Science as Culture, Vol. 10, No. 1, Pp. 113-119. Schäfer, M. S. (2012). Taking Stock: A Meta-analysis of Studies on the Media’s Coverage of Science. Public Understanding of Science, Vol. 21, No. 6, Pp. 650-663. Schall, V. (2000). Science Education and Popularization of Science in the Biomedical area: it's Role for the Future of Science and of Society, Mem Inst Oswaldo Cruz, Vol. 95, and Suppl.1, Pp. 71-77. Snyder, P. J.; Mayes, L. C. & Spencer, D. (2010). Science and the Media: Delgado's Brave Bulls and the Ethics of Scientific Disclosure. Academic Press. Thompson, J.B. (1995). The Media and Modernity: A Social Story of the Media. Stanford: Stanford University Press. Verhoeven, P. (2008). Where has the Doctor gone The Mediazation of Medicine on Dutch Television, 1961-2000. Public Understanding of Science, Vol. 17, No. 4, Pp. 461-472. Verhoeven, P. (2010). Sound-bite science: on the Brevity of Science and Scientific Experts in Western European Television News. Science Communication. an Interdisciplinary Social Science Journal, Vol. 32, No. 3, Pp. 330-355. Weigold, M. F. (2001). Communicating Science: A Review of the Literature. Science Communication, Vol. 23, No. 2, Pp. 164-193. Weingart, P. (1998). Science and the Media. Research policy, Vol. 27, No. 8, Pp. 869-879.